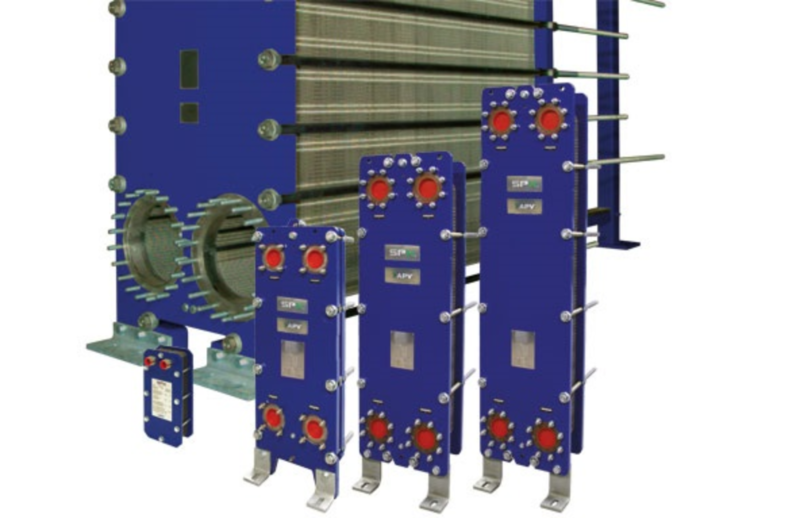 Plate & frame heat exchangers. APV, an SPX FLOW Brand, provides a unique range of highly functional solutions, systems, and products that address key business drivers. SPX FLOW bases its APV solutions on advanced technology products including pumps, valves, homogenizers, mixers and APV heat exchangers, as well as production efficiency experience, development expertise, maintenance management and regulatory compliance. The APV product portfolio includes a wide range of pumps, valves, heat exchangers, mixers and homogenizers designed for use in the food, dairy, and brewing industries, as well as in chemical, healthcare, pharmaceutical processing and heavy industries. Engineering excellence, allied to stringent quality control, ensures that SPX’s unrivaled range of APV products complies with the highest international standards for hygiene. In the light of growing pressure worldwide to deliver safe, high-quality food, all SPX products are designed for easy cleanability, whilst minimizing the use of valuable resources, such as energy. The global applications for industrial heat exchangers calls for a wide and deep product range, putting great demand on the equipment. SPX FLOW’s portfolio of APV heat exchangers is designed to match your needs, whether this is for very small flows, or the extra-large kind, up to 4500 m3/h. With our selection of materials, connections, and accessories, we can supply equipment for practically every heat transfer need. The ParaWeld and Paramine technologies expand the boundaries for gasketed plate heat exchangers. Added our long experience in after-sales services, SPX FLOW is your all-round partner for heat transfer. To learn more about APV and its products, visit their website here.